Galaxy S7 and Galaxy S7 Edge owners are probably wondering if they should consider upgrading to the Galaxy S8 or Galaxy S8+. That’s going to be a tough decision to make, since those phones should still be holding up well after only a year. To hopefully help you with that decision, we’ve put together a specs comparison chart of the four phones to show you on paper how they all differ. On a basic level, you have upgrades in many of the key areas. For example, you’ve got Qualcomm’s new Snapdragon 835 processor in the S8 line vs. last year’s Snapdragon 820 in the S7. The displays are an upgrade as well, at least in terms of size without adding much extra bulk. The new Galaxy S8 phones also include a USB Type-C port, on-screen or virtual navigation buttons, a Bixby button, Iris Scanners, Bluetooth 5.0, and more internal storage out of the box. On the other hand, you have the same rear camera as is in the S7s, same or smaller batteries (S8+ battery is smaller than S7 Edge), and the same IP68 water resistance. 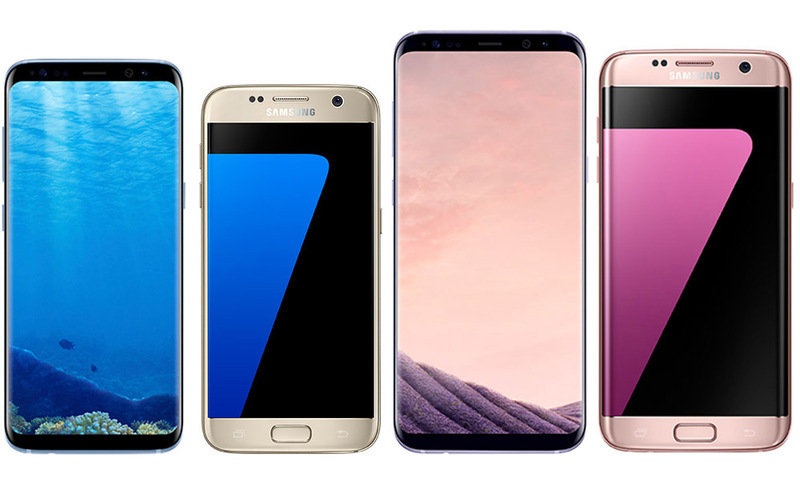 So overall, the Galaxy S8 line shows solid upgrades that you expect from one year to the next, but the really big one is likely the wild new display setup. Is that enough to get you to upgrade? You tell us. Notes: Those images are not at all a true or 100% correct size comparison. Also, we gave each phone Nougat since Samsung has updated most S7 models to Nougat at this time.